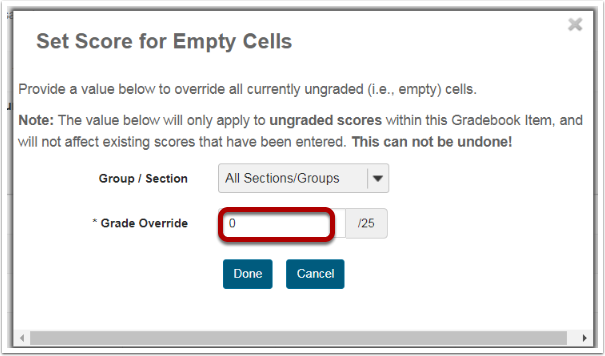 Sakai Community DocumentationSakai 19 User Guide (English) GradebookHow do I set empty cells to zero for a single grade item? Note: Gradebook does not include ungraded items in the course grade calculation. Empty cells could result in a higher course grade average for a student. To include a gradebook item in the course grade calculation, you must enter a grade of zero or higher. Find the grade item for which you want to assign zeros for missed work. 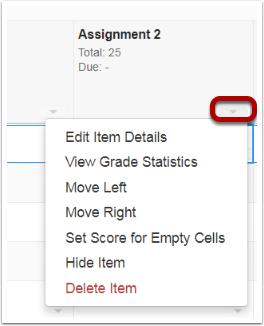 Select the dropdown arrow in the grade item's column header. 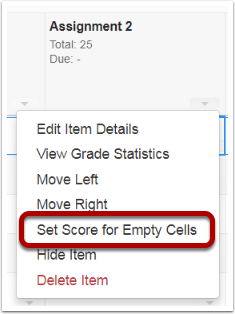 Select Set Score for Empty Cells. Enter the grade you will assign for empty cells. Use the Group/Section dropdown menu to select a specific group or section to assign this grade to (optional). Then, enter the grade you will assign to all empty cells. Click Done to assign. Click Continue to confirm the score and section or groups you have chosen to update. These scores can be overwritten later if a student turns in late work by clicking into the individual student's grade cell and entering the new grade.